Troy Barbell Dr-10 Dumbbell Saddle Rack (10 Pair), One Size by Troy Barbell at Strongman Pictures. MPN: DR-10. Hurry! Limited time offer. Offer valid only while supplies last. Holds 10 pair of dumbbells. Commercial quality steel. Not recommended for hex style dumbbell. 1 year warranty.. Assembly required. 98 in. L x 25 in. Holds 10 pair of dumbbells. Commercial quality steel. Not recommended for hex style dumbbell. 1 year warranty.. Assembly required. 98 in. L x 25 in. W x 31 in. H (137 lbs.). 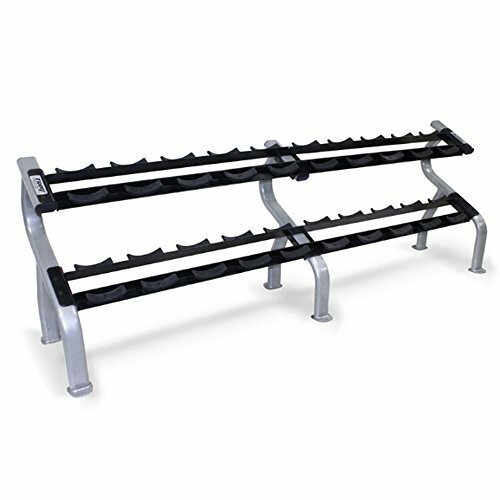 Troy Barbell commercial 10 pair rack has a rugged 3 x 2 frame with a scratch-resistant, powder-coated finish and anatomically angled tiers for easy access. Durable plastic saddles help protect dumbbells and reduce noise.